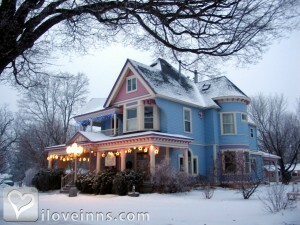 Saint Ansgar bed and breakfast travel guide for romantic, historic and adventure b&b's. Browse through the iLoveInns.com database of Saint Ansgar, Iowa bed and breakfasts and country inns to find detailed listings that include room rates, special deals and area activities. You can click on the 'check rates and availability' button to contact the innkeeper. Saint Ansgar, a picturesque little village known as the garden spot of Iowa, is surrounded by the Cedar River on three sides. Visit the quaint shops located in restored storefronts and vintage homes offering quilts, antiques and crafts. Experience local restaurants or try golf, canoeing, and hiking along the Cedar River Greenbelt. Stroll down our wide, tree-lined streets and enjoy Saint Ansgar's ponds and flower gardens. By Blue Belle Inn B&B. Are you a lover of plants? Would you want to spend a quick vacation in a town filled with beautiful flowers and well groomed grass? If your answer is yes, then St. Ansgar in Iowa is the perfect destination for you! Known as the Garden Spot of Iowa, the city is made of thriving farmland, stately trees, and colorful local gardens. Although relatively a small town, St. Ansgar is highly progressive. Perhaps you like to be treated like a queen and pampered? Stay at a beautiful St. Ansgar bed and breakfast and experience a home away from home.St. Ansgar is known for its interesting area attractions, such as the Mill Dam, White Deer Park, Acorn Park and Golf Course, Hamlin Garland refuge area, and different hunting and fishing areas along the Cedar River. By Blue Belle Inn B&B.